Tyler the Creator’s music festival Camp Flog Gnaw, drew huge crowds with highly anticipated musical performances and other attractions for fans of all kinds. 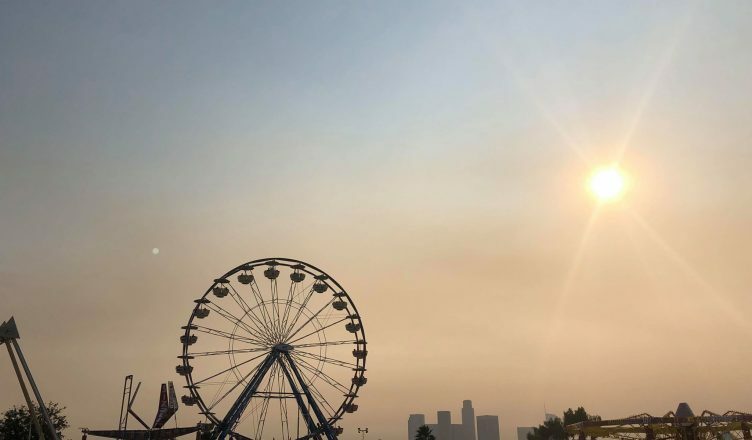 The annual Camp Flog Gnaw Carnival occurred over the weekend of Nov. 10 at Dodger Stadium in Los Angeles for its seventh annual installment. The event was hosted by rapper, fashion developer, TV actor, and whatever else you want to call him, “Tyler, the Creator.” Although Camp Flog Gnaw is a music festival, it is designed to be much more than that. Camp Flog Gnaw attempts to create an escape from the outside world into a music fan’s dream destination. Two stages featured artists such as the up-and-coming Hobo Johnson and hip-hop staples Kanye West, Kid Cudi, and A$AP Rocky. With carnival games and rides, various camp decorations, and unparalleled performances, Camp Flog Gnaw is an experience any festival goer should add to their bucket list. The atmosphere was beautifully crafted by all those involved, with each detail creating a true summer camp vibe, one full of unity and utter happiness. When walking into the venue through rows of winding lines, loudspeakers broadcasted directions, always referring to event attendees as campers. After getting past the security screenings, visitors walked up a hill. Upon reaching the peak, they witnessed an overview of the wonders the weekend had to hold. The skyline of Downtown LA loomed in the distance with an ashy, red tint as a result of the fires blazing in the valley a few miles south. The jaw-dropping landscape, showcased high-flying rides, two Ferris wheels, swings, and so much more scattered throughout. All of these structures, from the city skyline to the towering carnival rides, transformed the bland parking structures of the Dodger Stadium into the LA County Fair’s little brother. Despite the music performances beginning at about 12:35 p.m., the main attraction seemed to be none other than Kanye West’s clothing. No line for any ride was close to rivaling the wait time for purchasing merchandise from the hip-hop duo, Kanye West and Kid Cudi (otherwise known as Kids See Ghosts, who would be headlining Sunday night). From the time the gates opened to the time the stadium was cleared, the lines raged on with individuals desperate to get one piece of merchandise from hip-hop moguls Kanye West and Kid Cudi. Hordes of eager yet frustrated fans waited upward of three hours with hope that the clothes would remain available. The energy throughout the weekend seemed to gravitate toward the headline event of Sunday night however, they were not the only artists the crowds couldn’t wait to see. A few artists showcased powerful sets that the crowd couldn’t get enough of. Despite not being the biggest name of the day, Rex Orange County completely shined throughout his hour-long set. The crowd’s energy matched his insane vocal riffs and well-designed set, featuring a shifting sky background to match his always flowerlike aesthetic. As the sun set, his voice somehow softly boomed into the crowd in a way that makes as little sense as the oxymoron itself. The crowd was lovingly involved, echoing each and every line, showing just how much traction Rex has picked up in recent months. Playboi Carti’s set was an entirely different vibe from that of Rex’s; as the sun was well gone and night time loomed, Playboi Carti performed hit songs “Shootah” and “Flatbed Freestyle.” He greatly encouraged the crowd to form mosh pits and match his on-stage energy, and they responded accordingly. Those who managed to stay through the whole set shoved and swayed to the heavy beats and distorted vocals. As Saturday concluded, rhythm and blues singer SZA, whose debut album CTRL brought her support from countless fans, gave the headline performance. The crowd favorites seemed to be her pieces “Love Galore” and “Normal Girl.” SZA opened each song with brief background statements that perfectly captured the charisma and on-stage energy that has garnered her such a devout following. As the night concluded, she delivered a heartwarming and impressive set to end the long Saturday. The singer battled many emotions as she sang her hit song “Twenty Something,” which she dedicated to the late hip-hop artist Mac Miller, who passed away in September. All around, the crowd was unified. The audience seemed to appreciate the space given to reflect on the passing of hip hop’s beloved Mac Miller, especially as his image spanned the screens on each side of the stage. Sunday featured performances by artists such as Billie Eilish, Earl Sweatshirt, Lauryn Hill, and Brockhampton. However, nothing was equivalent to the anticipation for Kids See Ghosts. Although the duo would be on stage at 10:10 p.m., crowds began to gather at 2 p.m. just to ensure a decent spot for the performance. Discussions throughout the day centered on what the Kids See Ghosts performance would entail. I overheard several people pondering if Kanye West would perform in his now signature “Make America Great Again” hat. Many were also prepared for a potential Kanye West rant, which we have come to expect. However, the performance as a whole contained nothing of the sort. It was clear that the set was about sharing music and nothing else. The hip-hop dream team played nearly every song off its debut album Kids See Ghosts and also showcased beloved songs such as “Pursuit of Happiness” and “Paranoid.” The crowd’s energy was unmatched throughout the entirety of the set as individuals tried to take in as much as they could. Just about every individual in the crowd found themselves belting the lyrics to each song, creating a truly unified environment. The fact that the consistently controversial Kanye West accomplished this was something beautiful to see, as his music, not his politics, represent so much for so many. As the crowd chanted for an encore, the two stars walked off stage, concluding the weekend festival. The highly anticipated performances and overall event had fulfilled the crowd’s expectations. The event as a whole was seemingly over as soon as it began; with the constant entertainment provided, there was never a second to breathe. From the carnival rides and games to performances and connections made, Camp Flog Gnaw achieved its purpose as the music festival that prides itself on being much more. The weekend was beautifully planned and executed. Kudos to you, Tyler, the Creator; see you in 2019.